Registration: This event is open to the public, but registration is encouraged because it helps promote the event and plan ahead. Click here to register. Fr. 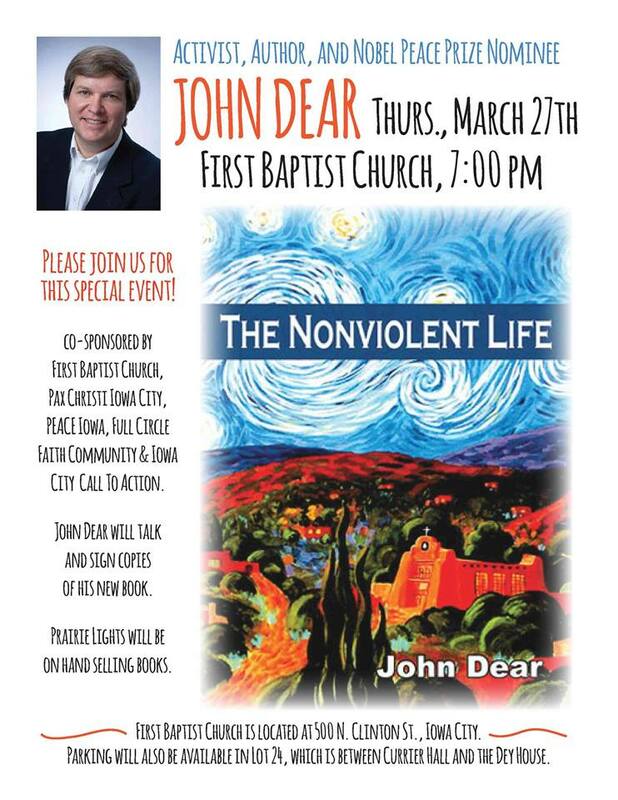 John Dear, the author of thirty books and a peace and justice activist who’s been arrested for nonviolent civil disobedience some 75 times, will give a public lecture at FBC on Thurs., March 27 at 7:00 p.m. Dear volunteered as a Red Cross chaplain in New York City following 9/11, has participated in peace and justice initiatives worldwide, and was nominated for the Nobel Peace Prize in 2008 by Desmond Tutu. FBC is partnering with Pax Christi Iowa City, PEACE Iowa, Iowa City Call to Action, and Full Circle Catholic Community to bring Fr. Dear to Iowa City as part of his national book tour for the newly released The Nonviolent Life. This free, public event will include a lecture, book signing and reception, with book sales by Prairie Lights. Please see www.fatherjohndear.org for more info on John Dear’s work. The event poster is available as a PDF (click here) and also as an image (shown below). Click the image below to enlarge.